One of the promises I made when I started Total Wealth was to keep you ahead of the curve and certainly ahead of the Wall Street herd. It’s why you subscribe and, frankly, a responsibility I take very seriously. Fortunately, we’ve got plenty of great examples of how this has worked out. For example, The Wall Street Journal reported in February 2013 that the country’s biggest investors – including George Soros, Kyle Bass, and Daniel Loeb – were making billions in betting against the Japanese yen by capitalizing on the fact that Tokyo had to weaken it to save that nation’s economy. That’s great but as Bill Patalon noted in his Private Briefing, I told subscribers about that trade a year earlier in a move that allowed anyone who followed along to double the returns those same Wall Street heavyweights achieved. At the time, that was 44% versus the 20% being lauded by the Journal. Today I want to share another example with you and use it to highlight two very important Total Wealth Principles. Understand what I’m about to share with you and you’ll never get burned again by false media narratives. More importantly, you’ll learn how to recognize an Icarus-like trajectory for what it is – and, hopefully, make a lot of money in the process. 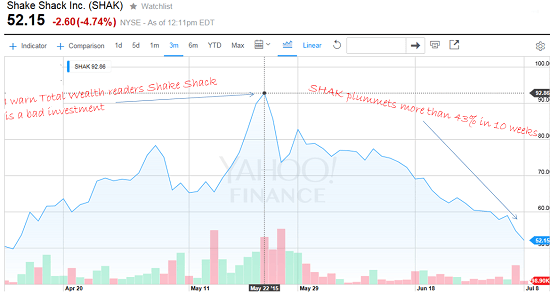 In fact, I told you as much on May 22 within three hours of the stock hitting a post-IPO, hype-driven peak of $93 a share. 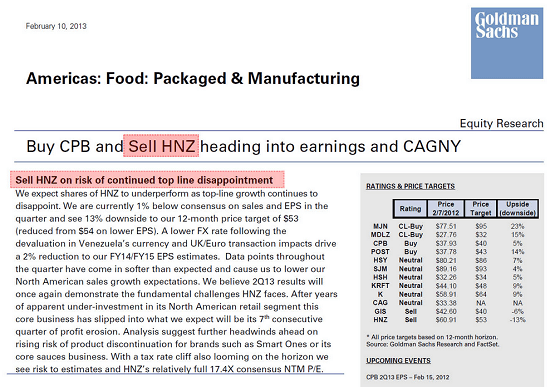 That was a full six weeks earlier than Morgan Stanley’s “Johnny come lately” report. It’s no wonder millions of investors fell for the pie-in-the-sky thinking. Moreover, the willful ignorance among analysts and seasoned observers who should have known better was astonishing. For me, the need for a Shake Shack shake out all came down to one number. A glance at the company’s page on Yahoo! Finance would have told even the most casual observer that the company was dangerously overvalued, with a PE ratio well above 1,200. To put that in perspective, that means the stock was priced at a level that would have required investors to wait 1,200 years to make money back on Shake Shack at the company’s earnings rate. By contrast, the S&P 500 carried a PE ratio of barely 15, meaning that not only were there far better deals for investors out there, but also that the stock was an insane outlier when it came to its valuation. Of course, at some level the stock’s trajectory tells us far less about Shake Shack than it does about the actors who fueled the artificial bull market. Before May 22, Shake Shack could do no wrong in the eyes of most analysts and financial publications. There are two key lessons here. Millions of investors look to Wall Street analysis with the implicit understanding that it’s forward-looking. In reality, they’re almost never first to the party. Fully 10 out of 15 analysts following Enron still rated the company a “buy” or a “strong buy” as late as November 8, 2001, three weeks after the Wall Street Journal reported the that company’s hidden losses, two weeks after the SEC announced its investigation into the company’s financials and months after a single independent analyst working for Off Wall Street Consulting Group first rang the alarm bell on May 6, 2001. In that sense, Morgan Stanley’s comically late acknowledgement of reality is emblematic of a perpetuation of delusion by Wall Street that’s very deliberate. There’s a definitive bias towards “buy” ratings. That’s because much of Wall Street has already made its money when a stock goes public by taking advantage of the insider dynamics driving modern IPOs I’ve written about here. Morgan Stanley should know… it was one of the firms that helped bring Shake Shack public in the first place. Further, it’s not uncommon for Wall Street firms to talk their own book – meaning that they are seeking to sway public opinion in such a way that their own predictions become self-fulling prophecies, and profitable ones at that. More egregiously, they’ll also talk against their own book, seeking to take advantage of blindsided investors by shorting whatever stock they’re buying, or vice versa, as was the case with Goldman Sachs, which has been identified more than once as trading against clients or counter to their stated public positions. H.J. 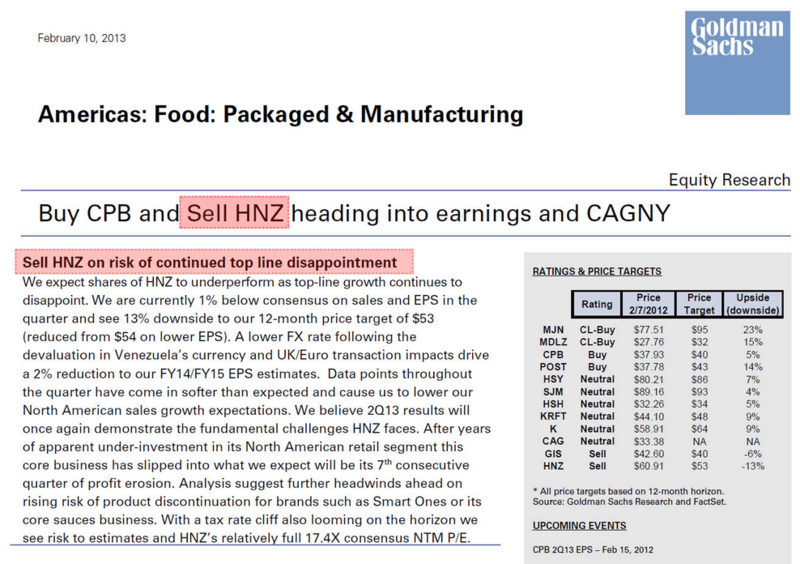 Heinz Co. (NYSE:HNZ) stands out as a prime example of what I am talking about. Click to Enlarge…yet decided to invest heavily ahead of a rumored investment by none other than Warren Buffett, reportedly booking at least 20% profits on the proprietary trading desk according to Business Insider. I don’t want to come across as being too hard on analysts, dozens of whom I’ve come to know and respect during the course of my career. Most are extremely intelligent and very likable people. It’s the way Wall Street forces them to practice their craft that I have a problem with. By definition, Wall Street analysts are reactionary. They’re always looking in the rear view mirror at numbers that are little more than signposts as to where a company has been rather than where it’s going. That’s the single biggest reason why analysts make terrible stock pickers. In the summer of 2011, for example, analysts correctly pointed out that the $600 billion in defense cuts Washington was imposing on America’s economy would create severe headwinds for defense contractors. But they failed to identify the immense opportunity that the slump would create for defense contractors like Raytheon Co. (NYSE:RTN) which provides the alternative weapons systems that would prove very profitable as the nature of warfare changed. But Money Map Report subscribers didn’t. They had the opportunity to enjoy returns of at least 132% over the same time frame… and counting. In the spring of 2012, analysts were largely silent on the profit potential presented by the Demographics revolution that was unfolding as the world’s population passed a critical aging milestone, so they certainly weren’t going to be the ones to guide readers to 99% profits from Becton, Dickinson & Co. (NYSE:BDX) like we did in the Money Map Report. More recently, it’s taken analysts months longer to catch onto Ekso’s growth potential. Anybody who waited for Wall Street missed out on the opportunity to capture 100% returns within six weeks of my initial recommendation or double digits profits today. Speaking of which, let’s talk about what’s next for Shake Shack before we wind up our time together today. I think the company is worth $20 a share… at best. That means the stock could fall another 60% from where it’s trading today on top of the 43% it’s already shed since I initially told brought it to your attention. to do the same using every tool available but where could I get help to learn more about this? Thank you for the kind words, Fred. Just make sure you have good risk management. Even though you're betting on a decline and that seems counter-intuitive, there are a few unique wrinkles; and, we'll cover those together. Dear Keith, thanks for your great writings. Nevertheless, you stoped writing in one of your great darlings, EKSO. Can you pls update us? Thanks for the kind words and for being part of the Total Wealth Family. With regard to Ekso, of course I’ll continue to write about the company, especially when there’s a material development. In the meantime, check out the company’s website where you’ll find all manner of information between updates. I agree with your comments about analysts. But you should include yourself in that category. I have folowed total Wealth for some time and have lost money on too many of them. Thanks very much for the kind words but, frankly, I am puzzled as to why you would include me in that category: 1) we are an independent publisher not an investment bank with conflicted interests; 2) we do not trade against clients as is commonplace on Wall Street and, in fact, have strict policies against personal ownership covering our entire staff myself included; and 3) we are frequently months ahead of the herd and have a well documented record that reflects that with hundreds of thousands of subscribers who have had the opportunity to profit since we began. If, on the other hand, the insinuation is that I am not perfect, I’m guilty as charged. Despite my best efforts, not every recommendation will be profitable even though I would like very much for that to be the case. That’s why we spend a lot of time discussing appropriate risk management rules and tactics – so you can use them on any investment, not just those I’ve recommended. To that end, your email suggests that you may have a different perspective, perhaps a shorter time line, tighter risk tolerances or simply not enough patience – any one of which can potentially put you in conflict with market conditions or specific recommendations. For example, years ago I met an investor who was frustrated that he kept getting stopped out of recommendations at a loss that later took off on what would have been extraordinarily profitable runs had he hung on. As it turns out that he’d been running his trailing stops too tightly so daily volatility became his enemy rather than the decisive advantage others enjoyed on the way to huge profits.